"I'll be the first to acknowledge that we still have work to do," he said. "Sunlight truly is the best disinfectant. We will not ignore these problems or hide our heads in the sand." And he ordered a review of the Justice Department's approach to consent decrees with errant police departments, ultimately determining that his civil rights unit will turn away from investigating patterns of excessive force and racial profiling by local law enforcement and instead focus resources on prosecuting individual police officers who break the law. The attorney general has issued new priorities for immigration judges in an effort to reduce heavy backlogs in those courts. He has promised to hire dozens more judges and monitor their efficiency through what he describes as "benchmarks." He has begun to crack down on immigrants who become naturalized citizens through fraud, moving to strip those people of their citizenship in court. And he has threatened to withhold U.S. grant dollars from "sanctuary city" jurisdictions that don't share information with federal immigration authorities. Under Sessions' watch, the Justice Department also determined that the Deferred Action for Childhood Arrivals (DACA) program was "an unconstitutional exercise of authority by the executive branch" and could not be defended in a court challenge by Texas and other states. Sessions explained himself at an event this week honoring former President Ronald Reagan and the people who worked for him. "We don't think illegal drug use is 'recreation,' " the attorney general said. "Lax enforcement, permissive rhetoric and the media have undermined the essential need to say no to drug use — don't start." One year ago today, President Trump promised that a new era was beginning at the Justice Department. PRESIDENT DONALD TRUMP: It is with great pride - very great pride - that I say these words to you right now, Attorney General Jeff Sessions. 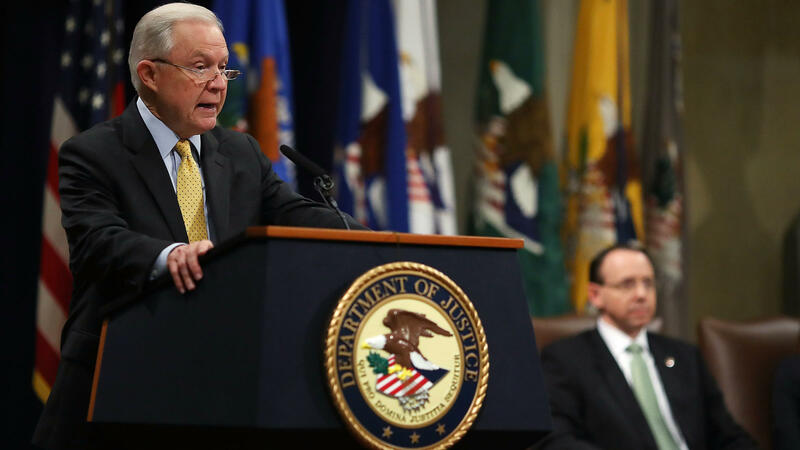 INSKEEP: In a year, Sessions has transformed the institution's approach to civil rights and immigration, all while an investigation continues into Russia's role in the 2016 election. NPR justice correspondent Carrie Johnson has covered the whole year. She's on the line. CARRIE JOHNSON, BYLINE: Hi, Steve. INSKEEP: How different does the department feel to you when you walk through the halls or get people on the phone? JOHNSON: It does feel different. Of course, the department has had some morale problems, in part because President Trump has been attacking both the Justice Department and the FBI for many, many months as a laughingstock and possibly politically biased. Also, Steve, there are at least six major jobs requiring Senate confirmation still open at the Justice Department one year in - more than one year in. And there's not a quick sense that those jobs are going to be filled. INSKEEP: Well, you mentioned the president's attacks on his own Justice Department. Let's focus on Jeff Sessions here. At his confirmation hearing, he assured senators he would be independent - he would make independent judgments. He later then did, over the president's objections, recuse himself from the Russia investigation - said he shouldn't be making decisions about it. But what about more recently? JOHNSON: You know, the first words out of his mouth at his confirmation hearing - Jeff Sessions - were that he would be independent of the president. He's actually tried to have it a bit both ways, especially when it comes to criticism of the people inside his department. Sessions has offered some words of praise for his deputies, including Deputy Attorney General Rod Rosenstein. But he also throws critics like the president a bone, saying that he's aware there are sharp criticisms of the department; sunlight is the best disinfectant; and he's not going to ignore problems or bury his hand in the sand when he encounters them. INSKEEP: Just to understand this - I mean, the president appoints the attorney general. The president is the boss. But is the job such that the attorney general should always be taking the president's orders? JOHNSON: Well, in matters of policy, the president has a big say. In matters of law enforcement, the practice since Watergate is that the president should have no say. And that's the bright line. INSKEEP: OK. Well, let's talk about policy as well - policy in law enforcement here. Jeff Sessions has made a number of announcements. He's got clear priorities. And I'm thinking of one in particular - the federal approach to marijuana, which has been legalized in many states but is, of course, illegal at the federal level. Sessions changed the guidance for federal prosecutors and law enforcement officials. But we were told at the time it was not clear how much would actually change in terms of prosecutions on the ground. Can you think of an issue, Carrie Johnson, in which Jeff Sessions' different approach has actually resulted in something different on the ground? INSKEEP: ...Unless Congress were to intervene in some way. And that's the thing that's still being debated. INSKEEP: And he has, you're saying, caused stricter enforcement or stricter punishments, if that's precisely the word - stricter outcomes for people who are found to be in the country illegally. JOHNSON: Yeah. And there's another big area where he's done a lot, which is with respect to civil rights, particularly police investigations - only charging individual officers, not investigating entire police departments anymore. INSKEEP: NPR's Carrie Johnson - always a pleasure. Thank you.